Smith at the 41st Daytime Emmy Awards. Freddie Matthew Smith (born March 19, 1988) is an American television actor. He is known for his portrayal as Marco Salazar in the new franchise of 90210 aired on The CW. He is best known for his character Sonny Kiriakis, the first openly gay contract role on the daytime soap opera Days of Our Lives. After high school, Freddie moved to Los Angeles, beginning his acting career in 2008 appearing a cameo role in the paranormal series Medium playing a Senior Boy which is unaccredited during that episode. He appeared in the short film titled Weak Species co-starring Erik Smith and in the film One Wish released in 2010. He also has done commercials for Kay Jewelers, Taco Bell, Carl's Jr, McDonald's and Verizon. Freddie Smith was born to Fred and Renee Smith. He grew up as an only child but is very close with two of his cousins. Smith "lived and breathed basketball" until his senior year in high school when a friend suggested he take a theater art class. Smith graduated from Edgewood Senior High School in 2006. On October 6, 2014, Smith crashed his car in Kingsville Township, Ohio, near his alma mater, critically injuring his passenger, Alyssa Tabit. He pleaded guilty to vehicular assault and DUI and was sentenced on February 18, 2015. He was sentenced two-years probation. His driver license was suspended for one year. He also was ordered to pay $1400 in fines. Tabit wrote a letter to the judge asking for Smith to be spared prison. In July 22, 2018, Freddie became engaged to Alyssa Tabit. 2008 Medium Senior Boy Episode: "But for the Grace of God"
2011 ACME Hollywood Dream Role Himself Episode: "Freddie Smith"
^ a b c Terry, Shelley (October 8, 2014). "Soap opera star crashes car in Kingsville Township". Star Beacon. Retrieved October 8, 2014. ^ jaayro (2 May 2009). "Weak Species (2009)". IMDb. Retrieved 27 October 2014. ^ TERRY, SHELLEY (January 25, 2012). "Edgewood graduate in Valentine's TV commercial". Star Beacon. ^ "Freddie Smith joins cast *minor spoilers*". TV.com. CNET. December 9, 2010. Retrieved December 10, 2010. ^ Z., Martha (December 9, 2010). 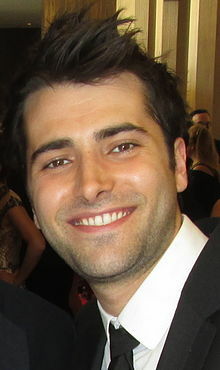 "90210 - Freddie Smith joins cast". SpoilerTV.com. Retrieved December 10, 2010. ^ Martin, Denise (Jul 17, 2011). "90210 Season 4 Spoilers! Is Teddy Gone? Can Adrianna Be Redeemed? Will Naomi Have a Baby?". TVGuide. ^ Di Lauro, Janet (June 15, 2013). "25 Facts About Freddie Smith". ^ Reiher, Andrea (May 1, 2013). "2013 Daytime Emmy Awards nominations: 'Young and the Restless' leads with 23". Zap2it. Retrieved May 2, 2013. ^ Goldberg, Michael (September 16, 2015). "Freddie Smith Returning to 'Days of our Lives'". Serial Scoop. United States: Blogger (Google). Retrieved September 16, 2015. ^ "Freddie Smith's "Emotional" DAYS Comeback". Soap Opera Digest. United States: American Media, Inc. 40 (42): 5. October 19, 2015. ^ Goldberg, Michael (April 13, 2016). "Freddie Smith Returning to Days of our Lives". Serial Scoop. United States: Blogger (Google). Retrieved April 13, 2016. ^ Wilson, Lori (September 28, 2017). "Freddie Smith and Christopher Sean Preview PaulSon's Chaotic Wedding". SheKnows Soaps. Retrieved October 3, 2017. ^ Waldron, Robert (August 30, 2011). "Sonny Days". Soap Opera Digest. American Media, Inc. 36 (35): 44–46. ^ Terry, Shelley (February 19, 2015). "Smith avoids jail time in drunk driving crash". Star Beacon. Retrieved February 21, 2015. ^ Towner, Myriah (February 20, 2015). "'Days of Our Lives' actor gets probation for drunk driving crash after mother of girlfriend he critically injured begs judge not to send him to prison'". Daily Mail. Retrieved February 24, 2015. ^ "The 40th Annual Daytime Entertainment Emmy Award Nominations". New York, New York: emmyonline.org and National Academy of Television Arts and Sciences. May 1, 2013. Archived from the original on June 28, 2013. Retrieved May 1, 2013. ^ Nordyke, Kimberly (April 26, 2015). "Daytime Emmy Awards: The Complete Winners List". The Hollywood Reporter. Retrieved April 27, 2015. This page was last edited on 26 November 2018, at 10:51 (UTC).